A classic marzen style lager, amber in color with a rich, toasty malt flavor and finish. Well balanced and smooth. 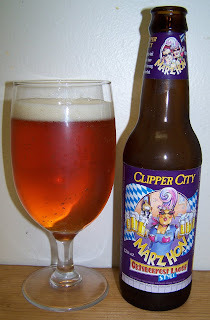 Marzen is the style of beer traditionally associated with Oktoberfest. The name is a play on words since in Baltimore, everyone is "hon!" Once a year this beer gets a special "Oktoberfest" label. Pours a true copper color with a soapy white head. Nice caramel malts on the nose with a light hop background. Very nice classic Oktoberfest tastes of caramel malts on this beer. The head didn’t stick around too long and there is little to no lacing. It starts out with a sweetness of caramel malts then a nice drying hop effect and a very pleasant caramel malt finish. This is a pretty good Oktoberfest. This is a nice beer even now at 67 degrees it’s even smoother than it was when it was colder. I do recommend this Oktoberfest. It has a very pleasant caramel malt flavor. It holds it own against any of the American Oktoberfests that I’ve had so far. It’s not the most flavorful Oktoberfest but it’s still very good so I’m giving it a B-.